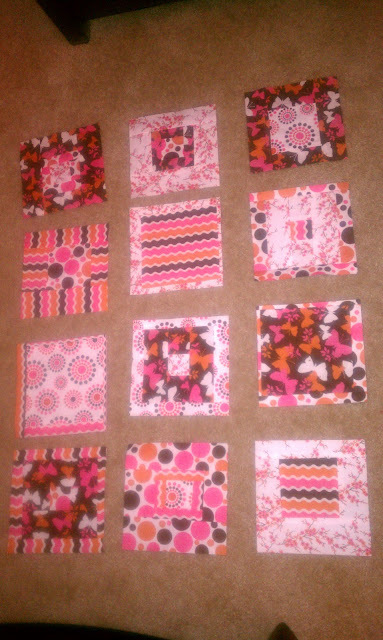 My Version of Moda's "Modern Squares Quilt"
Long time no post!!! It has been way too long since I have updated this blog... I blame it on all the hustle and bustle of the holidays as well as the excitement of purchasing our first house (SO EXCITING)!!! Amongst all of the excitement over the past two months I have found the time to make this amazing quilt for my cousin who is having a baby girl this April. I fell in love with the squares, when I was looking at the Modern Squares Quilt pattern from the Moda Bake Shop website.Yes, I realize that the name sounds a bit funny but this blog has transformed their patterns into recipes and use baking references when talking about their fabric, absolutely adorable and so much fun to look through the patterns! Anyway, I modified the squares to make them a little bit smaller and I only ended up having 12 squares as opposed to the pattern that calls for 20; this pattern is for a baby therefore I felt as though it needed to be a bit smaller. The fabric that I used for the squares was a simple cotton fabric that I had found at JoAnn's fabric. My backing fabric and the fabric I used in between the squares was a fleece (so soft and perfect for a baby), also from JoAnn's!